Thanks to your support, a long-suffering elephant named Nosey has been spared a grueling weekend giving rides at the Oak Haven Farms & Winery in Sorrento, Florida. In response to our alert asking supporters to urge the Winery to cancel plans to use Nosey this past weekend, you flooded the Winery with emails, calls, and posts on Facebook. Hugo Liebel, Nosey's exhibitor, is currently under investigation by the U.S. Department of Agriculture (USDA) for alleged violations of the Animal Welfare Act following numerous complaints submitted by IDA and others. The USDA fined Liebel in 2013 as a result of earlier charges claiming more than 30 welfare violations, including failure to provide adequate veterinary care and to handle Nosey safely in public. Oak Haven Farm & Winery, a strawberry farm in Florida, is teaming up with infamous exhibitor Hugo "Tommy" Liebel to host rides featuring the suffering elephant Nosey (aka "Tiny") this weekend, despite abundant evidence of Liebel's decades-long neglect of her. Please urge Oak Haven Farms & Winery in Sorrento, Fla., to cancel the rides immediately. 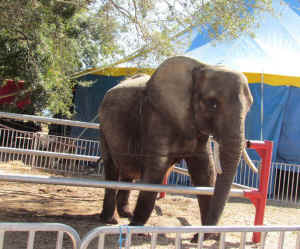 Last year, the U.S. Department of Agriculture ordered Liebel to pay a penalty to settle nearly three dozen charges of violations of the federal Animal Welfare Act, most of them related to his mistreatment of Nosey, including repeatedly chaining her so tightly that she could barely move and denying her necessary veterinary care. Learn more about Liebel's unrelenting neglect of Nosey's health and well-being - Liebel Family Circus Factsheet - PDF.